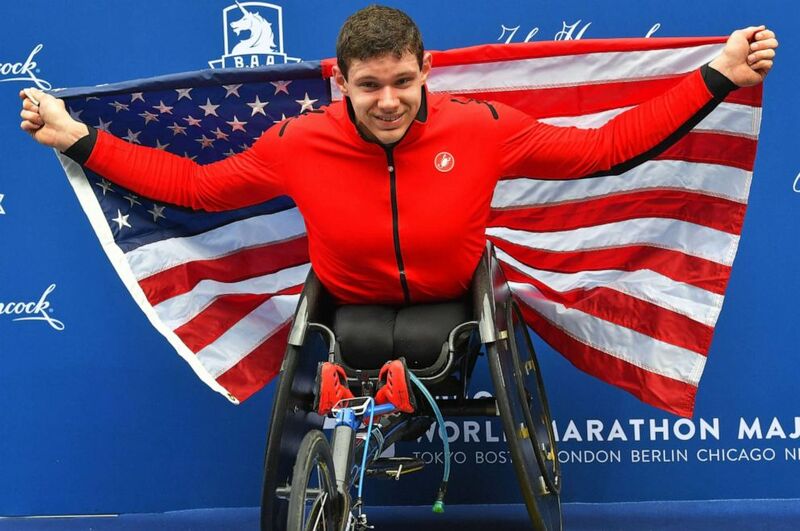 Daniel Romanchuk became the youngest person ever and the first American in 26 years to win the men's wheelchair division of the Boston Marathon Monday. "It's an amazing, amazing thing to happen," Romanchuk told ABC News. "I'm thankful to God for the opportunity that's been presented." I have been winning, but I never go into a race expecting a certain place or something like that. I like to keep my goals within my own power. "I have been winning, but I never go into a race expecting a certain place or something like that. I like to keep my goals within my own power," Romanchuk said. Daniel Romanchuk celebrates after winning the wheelchair division during the 123rd running of the Boston Marathon, April 15th, 2019. Romanchuk is also a student at Parkland College in Illinois and trains at the University of Illinois, which he said is "an absolutely wonderful environment." In a statement to ABC News, Parkland College spokesperson Stephanie Stuart congratulated Romanchuk on his victory. Romanchuk is celebrating in Boston with his family, whose support he finds "hard to describe," and participating in Monday evening's awards ceremony. But after that he's looking forward to the next race: the London Marathon. "Pretty much the extent I look back on [races] is as learning experiences," he said. "It's entirely new the next race."